I'm not a sweets fan at the best of times. But recently I've found them even more repellant. Why? Because it seems Red Velvet cupcakes, pancakes, cookies, brownies(?) waffles and (gagging*) red velvet lattes are the latest revolting rage. Pinterest is filthy with pins of baking that looks like scabs. Cupcakes are barely tolerable as it is particularly with their trendy unhealthy icing to cake ratio. Frothy butter cream sits menacingly on top of sad excuses for cup cakes. The only thing that can make these little blobs of diabetes worse is when they are the color of type 'O'. I don't understand the fascination. You know something is seriously wrong when IHOP gets on board with the fad. How do they get that vibrant red anyway? I've tried to make icing for cookies using red food coloring and it just ends up pink. What sinister goings-on produce that blood red that people apparently find so attractive in deserts? Let's all take a minute and remember the groom's cake from Steal Magnolias. 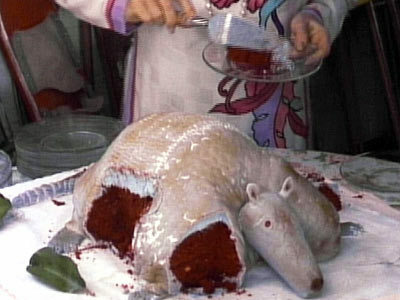 It was in the shape of an armadillo, complete with grey scaly icing, and when it was cut into it was red velvet cake. Absolutely nauseating. Others seem as uneasy as I am when it comes to violently colored baking. It is far from appetizing. 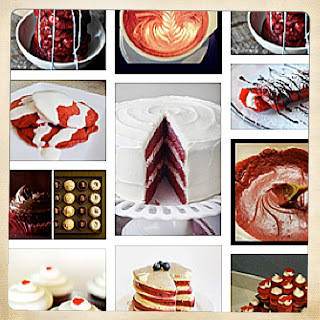 Having put forth my rant, I can say I have tried "velvet things" primarily in cupcake form. They taste like half-assed chocolate cake. Along with questionable color, vague taste is also a deterent. To illustrate my point about Pinterest and poor taste I searched Red Velvet. Out of a few hundred "pins" 3 pertained to fabric. Another disturbing discovery is Blue Velvet. Apparently an unholy shade of blue is also achievable and equally horrific. In my opinion any food that is the color of absolutely nothing in nature should be avoided. Also things the color of your insides or curtains from the 1500's should also be avoided.